Each month, in Food Network Magazine, there’s a recipe for an “Almost-famous ____________.” They’ve done almost-famous onion blossom (Chilis/Outback), almost-famous cheese biscuits (Red Lobster), almost-famous broccoli cheddar soup (Panera). You get it. Well, if you’re fortunate enough to live in Southern California (too snotty? ), you’ve probably visited a Clearmans restaurant–more specifically, their Northwood’s Inn establishment. 1) Their cheese bread. This stuff is to die for. You can buy the spread at the supermarket and make your own. I highly recommend this, though I take no responsibility for your imminent addiction to it. 2) Their cabbage salad. It’s hard to believe something as simple as cabbage salad could be such a big deal, but it is. And after making it, you’ll understand why. Northwood’s Inn serves this cabbage salad with their blue cheese salad. They’re absolutely stellar when mixed together, but they can each hold their own. The best thing about this salad, aside from bud-exploding taste, is how cheap and simple it is. Most of you will have all the ingredients on hand except for the head of cabbage—and if you DO have a head of cabbage on hand……why?? Combine all ingredients except cabbage. Whisk together until well-combined. Pour over the sliced cabbage in a large bowl and let soak for 24 hours, tossing once. The longer it sits, the better it gets. Day four of soaking is when it gets reallly good. Enjoy a little piece of Southern California! Eat this with a blue cheese salad, a side to hamburgers or to accompany your tostadas. Also, if you think you don’t like cabbage, this salad will prove you wrong. Promise. Have you ever tried this before? Ever heard of Northwood’s Inn? 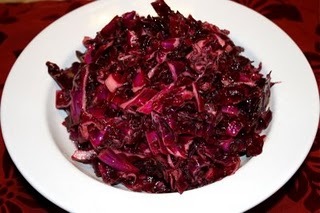 It has been several years since I had the Red Cabbage Salad, and boy what a treat. Everyone that tried it loved it. Thank you for sharing it. Oh my goodness I love that place. They also have The Boat in Pasadena. I don’t think that is the real name but that is what we call it. It is called Clearman’s Galley. They have the cheese bread and the blue cheese salad. They may have the cabbage salad but I’m not sure. But they also have the best chili burgers. I love the cheese bread though. It is one of my favorite foods. I always wanted my mom to be the spread from the store. Yummm it is making me hungry! Seems so easy! I love purple cabbage but my mom always cooked it. I can’t wait to try this recipe out. It’s fool-proof! And so delicious. Definitely gets better after soaking for a few days.